New Way Air Bearings® Chairman and CTO Drew Devitt Will Present New Technology at the 2012 European Society for Precision Engineering and Nanotechnology Conference. New Way® Air Bearings, the world’s largest manufacturer of porous media air bearing products, announced that its founder Drew Devitt will be presenting new technology for precision film handling in printed electronics applications at the 12th International Conference of the European Society for Precision Engineering and Nanotechnology (EUSPEN). Devitt’s research explores flexible films flowing over “Air Turns” rather than contact rollers, and the use of viscous shear in air bearing films for web tension control, cleaning, drying, and rapid temperature control. Air films are also used to protect differentially pumped grooves so the film can be passed into and out of vacuum chambers without contact. Euspen’s 2012 tutorial and workshop program will cover a range of key topics for the precision engineer and nanotechnologist. Devitt will be appearing at the Conference’s Precision Bearing Advancements Workshop, from 1:30pm to 4:30pm on Monday, June 4, 2012, along with Chris Gerrard, R & D Manager, Westwind Air Bearings, Dorset, UK; and Dr. Askar Gubaidullin, SKF Magnetic System Unit – S2M, France. 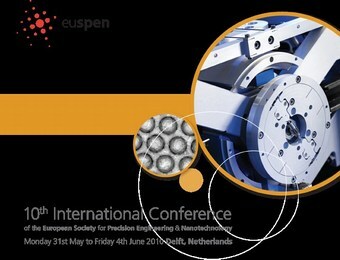 The European Society for Precision Engineering and Nanotechnology (EUSPEN) is a leading technical body in the field of ultra-precision and nano-manufacturing technologies. Linking leading industrialists and researchers worldwide, it has representation across over 32 countries. New Way Air Bearings, Inc. is the world’s leading independent manufacturer of modular air bearing products and the recognized provider of porous media air bearing solutions. The company manufactures a standard line of modular, off-the-shelf components including: Transition and precision zone air bars; flat round and rectangular air bearings; vacuum preloaded air bearings; radial air bearings; air bushings; and air slides. The company achieved ISO 9001:2000 Certification for its quality management system in November, 2008; and achieved ISO 9001:2008 Certification in January, 2010. New Way has now been included on Inc. Magazine’s list of the 5,000 fastest-growing, private companies in America for 2007, 2008, and 2009. In November of 2007, The Greater Philadelphia Chamber of Commerce named New Way recipient of its Technological Excellence of the Year Award for 2008. In both 2008 and 2009, New Way was named a Deloitte Fast 50 Technology company for the Philadelphia, PA, USA Region. Founded in 1994, New Way is located in Aston, Pennsylvania, USA, just fifteen minutes from Philadelphia International Airport. Visit New Way Air Bearings online at www.newwayairbearings.com. This web site includes specifications for the company’s full product range, design and installation guides, mounting hardware, air specifications, technical support, and a full range of accessories. You can also find New Way on YouTube, Facebook and Twitter. If you’d prefer even more direct contact, you can reach us at info@newwayairbearings.com, or follow the company’s official blog: Drew’s Views.